For those who have chosen My Guys Moving & Storage for their move, we have made arrangements with a third-party to provide a moving concierge service that gives you a completely free, easy-to-use tool to save you a ton of time (and many headaches) on your moving-related tasks. You’re going to love it! You’ll save an average of 5+ hours, 16 account updates, 21 emails and phone calls. In addition to all the time savings, you’ll also get access to special promotions & offers on entertainment at your destination. Quick form for Change Of Address. Pre-populated submission forms to update subscriptions for Newspapers & Catalogs, Loyalty Programs, Schools & Alumni Associations, Political, Professional & Social Organizations, Charities & Non-profits. Easy guide to help you sign up, transfer or disconnect electric, gas, and water services. Live Concierge Service to help you select the best deals & offers on TV, phone, internet, etc. (Comcast, Cox Cable and Verizon FiOS) at no cost to you. Additional promotions from local businesses and national retailers... names you know and trust! We realize there are many moving companies to choose from, so we go the extra mile to give you the most value for your moving dollar. Thanks for choosing MY GUYS! 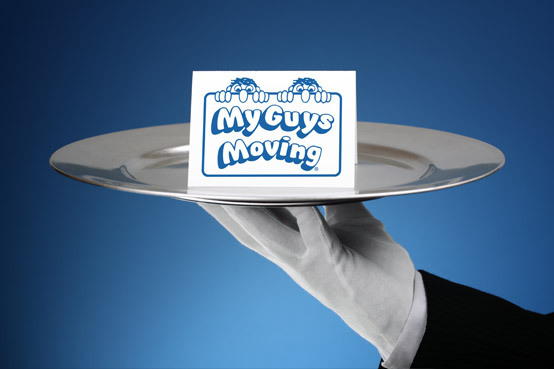 The moving concierge service is available only at participating My Guys locations, and is provided by third parties who can change their offers at their discretion.